Manuel flexes at the match on Saturday in Indio, Calif.
Patricio Manuel, the first openly transgender man to box professionally in the U.S., faced off against Hugo Aguilar on Saturday evening at a casino in Indio, Calif. The judges declared Manuel the winner. 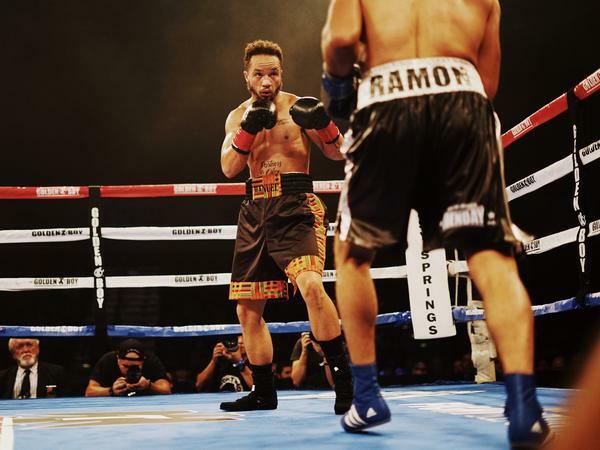 If you just happened to be in the crowd at a super featherweight bout in Indio, Calif., on Saturday evening, you might not understand the importance of that particular boxing match. But for Patricio Manuel, it represented 12 minutes of triumph. With that fight, Manuel, 33, became the first openly trans man to compete in a professional boxing match in the U.S. It was moment of joy following a long journey after Manuel first stepped into the ring as a high schooler in Gardena, a small city south of Los Angeles. "The first week I fell in love with the sport and never looked back," Manuel tells NPR's Steve Inskeep. He was drawn by boxing's rigor — "the specific, very grueling training from boxing, as well as the opportunity to compete consistently is what really attracted me to the sport." Boxing entered his life at the same time as another fateful event for Manuel: puberty. "I had always seen myself as a boy, even though society basically kept telling me no," he says. "And when I started going through puberty, it was like nature being like, no — you actually are a girl, no matter how much you don't want to be." Manuel trained hard, developing a high-pressure style, throwing lots of shots at his opponents. He worked up the ranks of women's boxing, winning five amateur championships – and qualified for the 2012 Olympic trials, the first time women's boxing would be in the games. But after sustaining an injury in the first round at the trials, Manuel had to withdraw. It was a career setback, but it forced a personal reckoning. "Boxing was this thing I love, but it was also a distraction from me really looking at myself, and being like 'Who are you, really? What will make you happy?' " he says. "I was just always like, 'Boxing makes me happy.' But there's more to me than just a sport. And when the sport was taken away from me, I really had to look at myself, and be like, 'There's more to this than just losing the fight.'" Manuel realized he had been lying to himself about being known as a female athlete and competing in women's boxing: "I really was a man that wanted to be in boxing, but I was afraid that I would lose my ability to compete." It was time. Manuel decided to go by the name Pat, to use he/him/his pronouns and live publicly as a man. He also began taking hormones and medically transitioning, having a mastectomy and then surgery to give him a male-shaped chest. But other complications arose now. His longtime gym told him that he could train there, but only if he didn't tell anyone — an impossibility for Manuel. "I've never lived my life in a closet, and I refuse to compromise that way. So I walked out of that gym and I never came back." He found a new gym that welcomed him, and he fought two amateur bouts in 2016 – winning one, losing the other. But it was hard to find opponents, and he had to get used to taking on boxers who fought in a style more like his own. "A lot of the male fighters — especially in Los Angeles, which is a primarily Mexican-populated boxing area — a lot of it's hunting someone down and ripping them to the body, which used to be my style in the amateurs," Manuel says. "But I faced a lot of female fighters who were really excellent boxers who worked on getting their distance, getting their points, moving out of the way. So it was an adjustment to turn from being the person who was always chasing down and breaking down the body of other fighters, to having someone do that to me." But he kept up his training regimen, and with some new support from Golden Boy, Oscar de la Hoya's boxing promotion company, Manuel was able to get his pro license to box as a man. Golden Boy also found him an opponent. So on Saturday evening, in an eight-fight card at a casino in Indio, Manuel battled a man named Hugo Aguilar. After four rounds, the judges declared Manuel the winner. As Manuel was interviewed in the ring about what it all meant, boos and whistles could be heard from the crowd. But Manuel wasn't shaken, and he says he wasn't angry, either. "I'm a black trans man. I've had people saying cruel, hateful things to me my entire life. People booing me – it's more about them than me. They don't know me. They don't know what I've been through. They don't know how much I love this sport, how happy I was in that moment. I refuse to give them power over me by feeling even angry toward it." And, he says, he'll be back. "This wasn't a one-show, this wasn't a publicity stunt. This is something I love, something I've invested my entire life to, this is something I've sacrificed for. This is just the start." NPR's Reena Advani, Merrit Kennedy and Kevin Tidmarsh contributed to this story. We have the story today of the first transgender man known to have won a pro boxing fight. 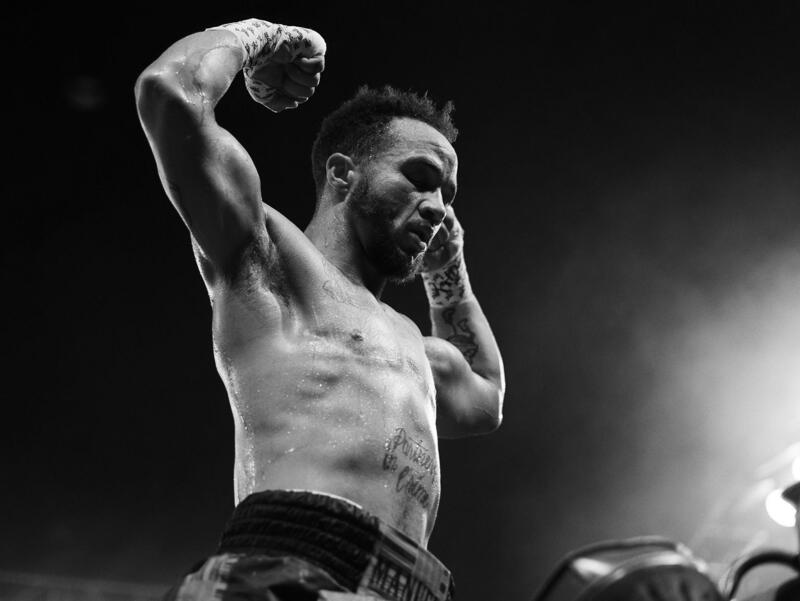 Patricio Manuel earned a victory this month. He is in his early 30s, which is a bit late to start a pro boxing career. It took time, he says, because when he was growing up, he was identified as a girl. PATRICIO MANUEL: I had always seen myself as, you know, a boy, even though society basically kept telling me no. And when I started going through puberty it was, like, nature being like, no, you actually are a girl, no matter how much you don't want to be. INSKEEP: Manuel began boxing as a girl then a woman, at the highest level. So you ended up with five amateur championships. Is that right? INSKEEP: Which means we can say - and you don't have to sound like you're bragging, but - you were great. You knew what you were doing. MANUEL: I knew what I was doing. INSKEEP: But a forced pause in his boxing career prompted Patricio Manuel to confront those feelings he says he'd had since childhood. He told a story at our studios in Culver City, Calif., not far from his home. When you were boxing, was there a point that you were thinking about your gender and who you were? MANUEL: Yeah. I think, actually, boxing really helped me start coming to terms with it. So when I started winning, when I started winning national titles and I started feeling more confident in myself is when I cut my hair and I started really going all in and presenting masculine and really started identifying as, like, queer, and as butch and identifying as, like, a masculine-of-center person. I probably would have gotten there eventually, but boxing really helped me give me the confidence to be like, no, this is my identity and I'm claiming it. INSKEEP: How was it that you arrived at the decision to transition then? MANUEL: Really because I was at my lowest point. I qualified for the first-ever women's Olympic boxing trials in 2012, but I was medically disqualified as a result of a shoulder injury that had been bothering me for a long time. And I lost my Olympic dream, and I think when the sport was taken away from me, I had to really take a look at myself and be like, there's more to this than just losing the fight that's making you unhappy. And I realized that I had been lying to myself that I was comfortable with being called a female athlete. INSKEEP: You then, I suppose, had to go some period without boxing at all, both because of the recovery from the injury and the recovery from the surgery and everything else. MANUEL: Yeah. You know, by the time I transitioned - I decided to medically transition - the shoulder was a lot better. I went a brief period of time not boxing. It was about six months, which is the longest I had been off since I started boxing in 2003. And part of that was because of having gender reassignment surgery - or gender-affirming surgery, with having a vasectomy and top surgery. But I also lost my gym that I had been with for a long time as a result of transphobia. INSKEEP: Somebody literally said to you, can't handle it, can't do this, get out of here? MANUEL: Basically, I was told that I could train in there, but no one can know that I trained at the gym. And I've never lived my life in a closet, and I refuse to compromise that way. So I walked out of that gym, and I never came back. INSKEEP: You found another gym, I guess? INSKEEP: I'm just thinking, was there a moment of awkwardness there at the beginning? You'd taken some time off boxing. You've got surgery. You've effectively got - it's the same body, but it's a different body. How different did it feel to get slugged as a man than as a woman? MANUEL: It definitely felt different, especially because my body took a while to fully adjust and develop under testosterone. There's a different way that male fighters fight in comparison to female fighters so it was an adjustment to turn from being the person who was always chasing down and breaking down the body of other fighters to then having someone do that to me. INSKEEP: So you had to be ready for more brutality? MANUEL: Yeah. Or a different type of brutality 'cause, let me say, those female fighters were definitely, (laughter), definitely teeing off on me, too. INSKEEP: So you went through this transition. You found a gym. You did some training. You fought - if I'm not mistaken - a couple of amateur fights. And then you had the opportunity earlier this month at a professional fight. What was it like in the moment before you went out into the ring? MANUEL: It was really exciting. I'm not going to lie. There was definitely a lot going on. There was a lot of pressure. There was a lot of media there, and I knew that my ability to be seen as a legit competitor really laid upon my ability to win in that fight. And I knew there was a lot at stake. But I think I really just tried to focus on, you know this is what you do. You've been through this 60 times, even if it's a little bit different than the pro fight. And I just really tried to also enjoy the moment. I really tried to, when I was there, be like, OK, be present to this. You've worked so hard to get to this moment. Try to enjoy every single second of it. MANUEL: I did. I really did. INSKEEP: I watched some video of the fight with a colleague. UNIDENTIFIED COMMENTATOR: Very entertaining, well-adjusted fight for both. INSKEEP: Both of us had the same response. If we did not know your backstory, we would not have known your story. It just looked like two guys fighting. MANUEL: And that's what it was. INSKEEP: Is that what you wanted me to see? MANUEL: That's what I wanted everyone to see - just two men who were in there, doing their sport, trying to win. UNIDENTIFIED COMMENTATOR: Patricio Cacahuate Manuel. INSKEEP: And you won, we should tell people who didn't see the fight, not by a knockout but by a unanimous decision of the judges, right? INSKEEP: What was that like? MANUEL: You know, I really wanted to knock out. (Laughter) I'm not going to lie. I really wanted to knock out. My opponent was tough. Maybe I'll get the knock-out the next fight. But as long as I keep winning, that's what's important to me. INSKEEP: There's also video of an interview that you did in the ring after the fight. INSKEEP: Would you describe what happened there? MANUEL: There was a large crowd that was cheering, but I think a lot of people heard people booing and jeering me in that moment. But, you know, honestly, I'm so used to people hating my very existence that it really didn't even - it didn't faze me. INSKEEP: You remember just what you said? MANUEL: The first thing I said was about it being such a long journey to get there. MANUEL: What I was saying was, I think if people knew what it took to get to this moment, it's been almost two years since I've been in the ring. MANUEL: I hear some fans aren't happy. It's OK. I'll be back. I'll make you happy then. INSKEEP: Meaning, I'm going to be back. I'm not going to be stopped by that. MANUEL: Yeah. I wanted people to know I'm not - this wasn't a publicity stunt. Like, this is something I love. This is something I've invested my entire life to. This is just the start. INSKEEP: Well, Patricio Manuel, thanks for taking the time to talk. MANUEL: Thank you so much. INSKEEP: Patricio Manuel is the first openly transgender male boxer to fight and win a pro match in the United States. Transcript provided by NPR, Copyright NPR.